A remote controlled motorcycle is a great toy for kids who are looking for something a bit different from an RC car. Some of the models here are ideal for younger children, as they have controls similar to that of a car. Others are more advanced and feature a gyroscope, and feature multiple channels to make for a more challenging drive. We have chosen a range of products to suit different ages, and shown the key features of each motorcycle to help you make the best choice for your child. As mentioned above, radio-controlled motorcycles come in a variety of different styles, and are therefore not all suitable for the same age group. Think carefully about your child’s ability level, or if they have any previous experience with RC vehicles. Don’t choose something too easy or your child may get bored quickly. It’s also important not to pick a toy which will be too hard for your child to use even with help, as they will likely become frustrated. As with any remote control toy, you need to think about any other vehicles which will be used at the same time. Some motorcycle toys can be used on different frequencies meaning several can be used together. Check the frequency of RC toys you already own to ensure the new motorcycle will be able to be used at the same time, if you wish to do so. Also consider where the toy will be played with. Some are only suitable for indoor use, or have a small range so won’t go far outside. Several can only operate on smooth surfaces, but there are a few which can work on most terrains. 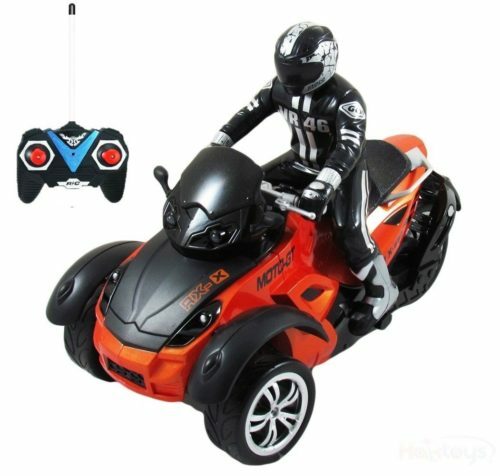 This is a perfect first RC motorcycle toy for a young child. The stabilizer wheels ensure the bike won’t tip over, making it easy to control. The bike is also quite large, at around 12 inches long. The pistol-style controller is easy for little hands to hold, and with a bit of guidance from parents, they will be driving the bike everywhere in no time. The range is over 60 feet, which means kids can play with the bike almost anywhere without losing signal. Parents and older kids will love playing with this fun toy, too. The eye-catching looks and Harley Davidson branding make it appealing to fans of the classic brand. Dads and grandads will love helping the kids learn how to control the bike! This RC vehicle is great for kids who want to take their toys everywhere and anywhere! It can be used in water and has a very long range of up to 200 meters. Parents will be pleased to know that the bike comes with rechargeable batteries, so you won’t have to keep replacing them every time your children play with it. The amphibious RC toy is very strong and durable – it can withstand being bumped and crashed without becoming damaged. The toy is suitable for children over the age of 3, although younger kids may need a bit of help from parents. Older children will also enjoy playing with the vehicle, as it is much more flexible than standard RC toys – they will love to experiment and do tricks with this toy! It can reach speeds of almost 10 mph and is also able to spin 360 degrees. Younger children will love to watch the lights on the bike, and everyone will like how realistic the details on the model are. 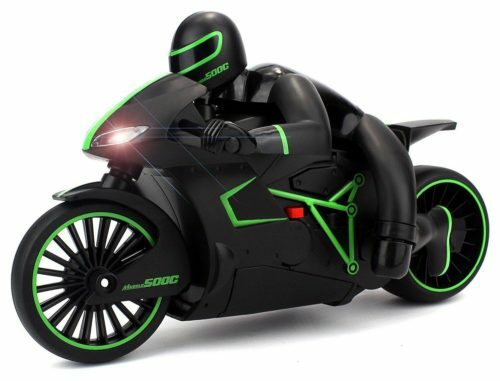 This futuristic-looking motorcycle is perfect for older kids who are looking for a new, cool RC toy. It is great for performing stunts. The bike features colorful LED lights, which make it perfect for playing at night-time too. The radio-operate bike toy features a unique design which makes it more stable and maneuverable than other motorcycle toys. The double rear wheels rotate and twist, which means the bike doesn’t keep falling over. However, it also allows the bike to lean left and right, just like a real sports bike. The motorcycle is great for practicing slalom courses – older kids and teenagers will love to race their friends around obstacle courses. This remote-controlled ATV trike is perfect for young children who want an exciting RC vehicle. The figure comes off to allow for imaginative play. Whilst the toy is modeled on an off-road vehicle, it is best suited for indoor use on a hard surface or low-pile carpet. It could also be used on a smooth sidewalk, but won’t work well on different terrains. The car is around 7 inches long and is strong and durable, making it perfect for kids who can be a bit rough with their toys. The vehicle comes in two colors each operating on different frequencies, meaning it’s possible to buy one of each in order to race them. The batteries take around 2-3 hours to charge, which then gives up to 20 minutes of play time. The controls are easy enough for a child aged around 3-4 years old to master. The vehicle can move forwards, backward, left and right and there is also a button for the headlights on the remote. 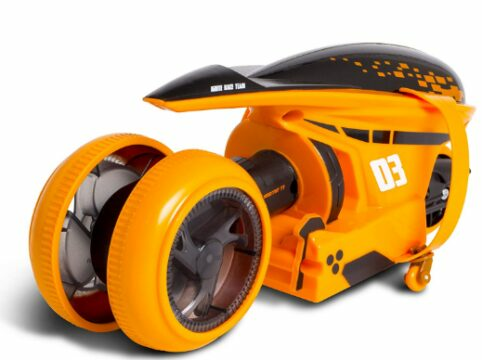 This unique radio control vehicle is great for performing stunts and tricks. The wheels rotate to the side to make the motorcycle ‘hover’, as well as allowing it to perform impressive tricks. It can be used indoors or outside, on smooth ground. On thicker carpets, it won’t be able to perform the trick moves as well. The toy operates on one frequency, meaning two cannot play together. The cycle features an LED light display which is sure to be a hit with the kids. There are small wheels at either side of the bike which gives it added stability, meaning it doesn’t constantly fall over. The RC toy is safe for kids aged 3 and above, although they might find it a bit difficult to use. The manufacturer suggests that it is more suitable for children over 5. 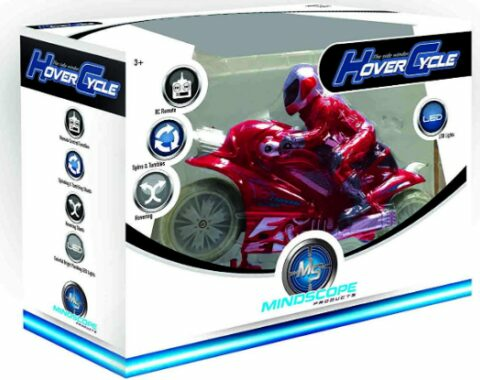 The toy can be used like a regular motorcycle by learners, then the wheels can be rotated sideways for more advanced users to learn how to perform stunts. This fun remote-controlled toy is perfect for young Star Wars fans. It features realistic details and sound effects which are sure to be loved by fans of the movie series. There are also light effects, which are great for playing at night. The Star Wars speeder bike toy works well indoors and is very easy to manoeuver with the simple controller. The bike can easily go around objects once your child masters the controls – it can make sharp turns and travel at high speeds. Kids will love re-creating their favorite scenes from the Star Wars movies. The bike is great to use in conjunction with other Star Wars toys and figures for a world of imaginative play. This stylish Blomiky JXD 806 Orange motorcycle toy is great for children over the age of 5. It is 1:10 scale, and looks just like a real sports bike. It features LED lights on the front and rear, which really add to the visual appeal as well as making it possible to race in the dark. 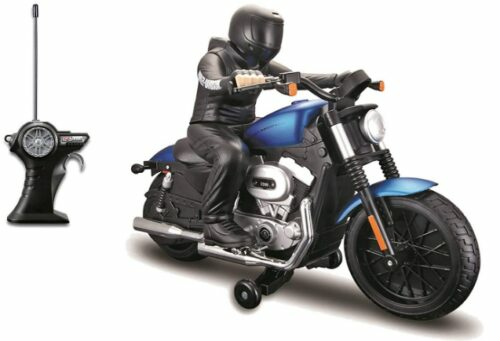 The motorcycle toy features rubber non-skid tires and is made from quality, durable metal and plastic. It travels relatively fast, so it’s best used in a large room without much of it, or even outdoors on a smooth hard surface. The controls are quick to respond and easy to learn with a little practice. This is a great remote-controlled bike for older children and teens. It features a built-in gyroscope which allows the bike to ride on the back tire. The tires are made of rubber, which is non-slip to allow good control on smooth surfaces. The 1:16 scale bike features realistic details, including LED lights for racing at night. It comes with a USB charger for the bike, whilst the controller takes 4 AA batteries. The charge takes around 30 minutes, which then gives up to 12 minutes of playing time. The range is up to 25 meters, which means it can be used outside as well as indoors. This remote control toy is ideal for boys and girls of any age. The built-in gyroscope ensures the motorcycle can maintain its balance – it can lean when turning just like a real motorcycle. It can be used outdoors – the bike comes with LED headlights for racing at night, too. The bike comes in either green or red, so your child can pick their favorite color. 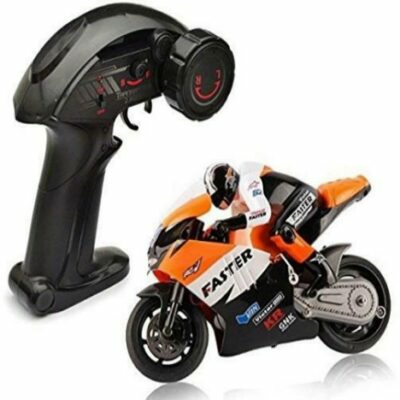 The RC toy comes with a 2.4 Ghz frequency controller, which means that several bikes can race together at once. Simply switch the bikes and controllers on one at a time, and test it works before switching on the next one. The motorcycle comes with a rechargeable battery, at the controller requires a 9V battery, which is included. If you are looking for a unique remote-controlled toy for your child, the Amphibious Stunt Bike is a perfect choice. It is easy for children of all ages to learn to use, and they will have great fun taking it out and about to new places. This three-wheeled vehicle is rare in that it can navigate just about any terrain, including water and sand, with ease. Parents won’t need to constantly replace the batteries on this toy – it comes with a rechargeable battery and charger for the vehicle. For RC fun on a budget, look no further than the Maisto Cyklone. It offers a range of premium features at a bargain price. Younger kids will be able to learn how to control the motorcycle with a bit of help from their older siblings or parents. It’s also challenging and interesting enough to keep older kids, teens and even adults entertained over and over again. There are two frequencies and two different colors schemes – it’s great to get one of each so friends or siblings can race together. The toy is great for encouraging your child to use their problem solving and hand-eye coordination skills, whilst having great fun at the same time.